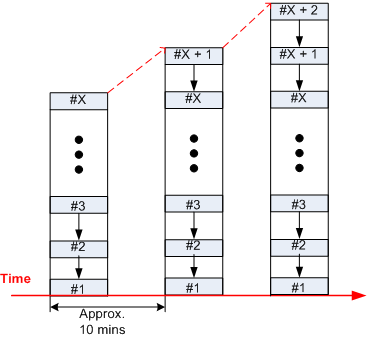 As the figure below attempts to illustrate, a new block of validated financial transactions is added to the Bitcoin blockchain approximately every 10 minutes. As of today, whenever a block is added to the blockchain, 25 newly minted Bitcoins spring into existence out of thin air. This number of bitcoins-per-block will be cut in half every four years until a total of 21 million BTC have been birthed into existence. 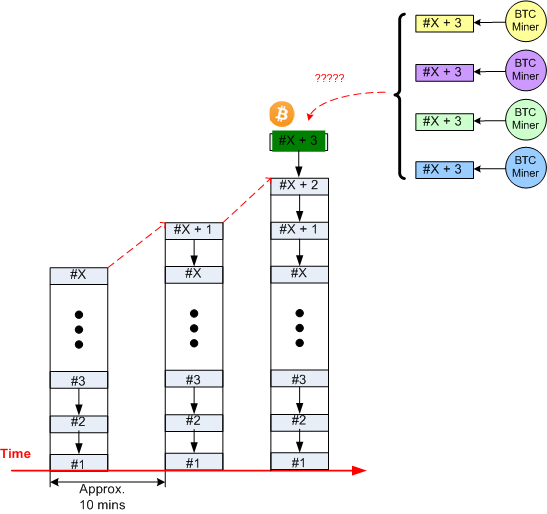 The next halving, which will result in 12.5 bitcoins being created per block, will happen in 2016. 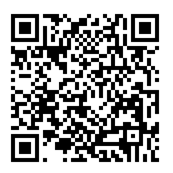 The last bitcoin will magically appear in the world sometime in the year 2140. So, who adds the blocks to the chain, and who gets the bitcoins? The answer to both questions is “the miners do“. Bitcoins are a miner’s reward for the energy it expends in solving a computationally intense computing problem whose difficulty may vary from block to block. If blocks get added too quickly, the difficulty of solving the puzzle goes up. If blocks get added too slowly, the difficulty goes down. A bitcoin miner’s job is to validate the transactions in each block and to preserve the integrity of the blockchain. The bitcoin network is comprised of thousands of these miners working together in accordance with a set of programmed-in protocol rules that ensure they do indeed work together in a consensus-based manner to secure the blockchain from external and internal hack-attacks. As the blockchain grows and more mining power is added to the network, the system becomes more trustworthy and hardened against thievery – including against rogue miner insiders. 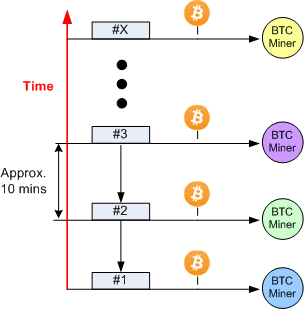 After a block is successfully added to the chain, all the miners go to work racing against each other to solve the next cryptographic math problem for the privilege of adding the next block and earning the bitcoin reward. The winner takes all – for that block only. And then the cycle starts over again. Wash, rinse, repeat.